In the Arts PROPEL approach to instruction and assessment, students write poems, and tackle other real-life projects as the starting point for exploring the works of practicing artists. Prepared by Project Zero and the Educational Testing Service with the help of teachers and administrators from the Pittsburgh Public Schools. 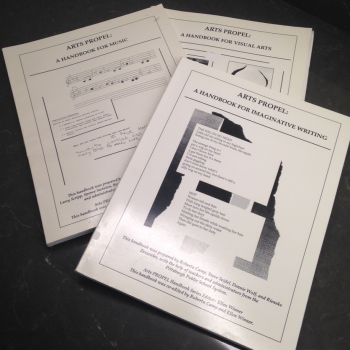 The Arts PROPEL handbooks, An Introductory Handbook, A Handbook for Imaginative Writing, A Handbook for Music, and A Handbook for Visual Arts, offer guidelines and models for creating a project-based curriculum and using portfolios to assess student work in the arts.